The Flash Panel 16 is an affordable LED panel that can be controlled via DMX or via the optional CF card controller (Model: FP CFC). Multiple panels can be linked together to make one large screen. Dynamic effects can then be played on it, which makes this system ideal for DJ’s and night clubs. Each panel has 16 RGB pixels, each of which can be individually controlled via any universal DMX512 controller. The panel also features 3 pin XLR, DMX input / output connectors and standard IEC connectors to link panels to each other. There are also stand dip switches on the rear of the panel for DMX addressing and stand alone operation. Considering purchasing the American DJ Flash Panel 16 DMX LED panel? Have questions? Ask people who've recently bought one. Do you own the American DJ Flash Panel 16 DMX LED panel? Why not write a review based on your experience with it. 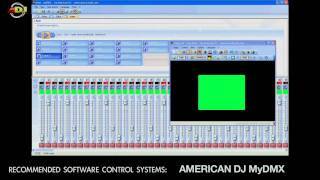 Seen a video for American DJ Flash Panel 16 DMX LED panel online or have you own video? Check out American DJ Flash Panel 16 DMX LED panel on DJkit.com!